Next Street is currently working with the executive leadership at The Children’s Aid Society, which serves children, youth, and families at more than 50 locations in some of New York City’s most under-resourced communities, providing them with the tools and support they need to realize their fullest potential and achieve lasting success and independence. The Next Street team developed 5-year financial projections for the organization that provide clarity on long-term sustainability and flag key risks. The projections contain the ability to run scenarios and adjust key assumptions to evaluate the financial impact of programmatic and strategic choices. This work is critically important given the current uncertainty in government funding streams, which are essential to the stability of all social service providers. Many nonprofits do not have the financial tools to evaluate and translate strategic decisions into daily action, and social services providers are no exception. The ability to anticipate financial hurdles, opportunities, and decision points before it’s too late is often overlooked. With this challenge in mind, Next Street’s work has aimed to help The Children’s Aid Society standardize and consolidate their financial position, including capital needs, program offerings, operating budget, and cash implications, in hopes others will employ similar practices and to elevate the importance of this strategic financial management among social services providers and other nonprofits nationwide. We are delighted to highlight the launch of the Business Equity Initiative! Eastern Bank has committed $10 million over the next three years to support the growth of enterprises of color. 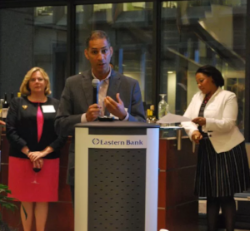 Launched by the Eastern Bank Charitable Foundation in April 2017, the Business Equity Initiative (BEI) was developed to mitigate growing inequality by combining business growth, supplier partnerships, and community transformative development as a means of addressing growing wealth and income inequality in Massachusetts. The Initiative is focused on growing enterprises of color by leveraging Eastern’s networks and philanthropic dollars as well as providing targeted, customizable growth tools including embedded trusted strategic advisors, operational support, growth capital, and market access to enterprises of color positioned for growth. The BEI matches top tier talent (former CEOs, successful former business owners, management consultants, strategists) and expertise to our entrepreneurs and enterprises of color to help them grow. Next Street is proud to serve as one of the strategic advisors to participating enterprises. To complement the embedded advisory support, Eastern is working to expand market access and provide growth capital for participating enterprises. Eastern Bank has committed to increasing their spend with suppliers of color and is working with partners to catalyze similar commitments. Eastern has partnered with the Greater Boston Chamber of Commerce to form a partnership of Pacesetter companies that are committed to increasing their supplier diversity, in numbers of vendors and dollars. Eastern is also working to develop a growth fund, which will provide integrated capital ranging from debt to equity. If you are an interested in learning more, please visit the BEI’s website, where you can find more detail on the program and application details. The NYC Department of Small Business Services recently hosted the Business Pitch Final Competition and Meetup. Next Street supported the development of the curriculum for the Business Pitch Education & Competition Program, designed to help business owners and entrepreneurs develop and tailor their business pitches to the wide range of audiences they encounter, including: investors, vendors, and prospective customers. On July 19th, ten finalists made their pitches to a panel of judges, competing to win between $2,500-$5,000 to help grow their business. Next Street is proud that two of the winners are clients of the NYC Business Solutions – Queens Center, which is managed by Next Street. Next Street is looking for a high-performing team members across offices, who will work closely with Firm leadership to support and lead engagements serving small businesses, non-profits, anchor institutions, and government agencies. Visit our Careers page to apply!